In the shockingly long interval since I last posted here, a lot of exciting things have happened. 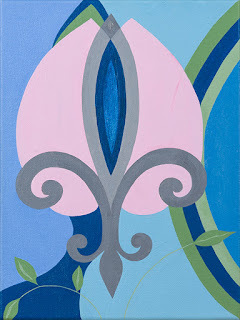 Most important, I started a new series of paintings exploring the fleur de lys as a point of departure for composition. The fleur de lys is an elegant ancient symbol that has always had resonance for me. In my interpretation, it represents man's idealistic desire to imprint his view on nature and the environment. For me the symbol also has personal meaning. It refers back to my time as a young art student in France, where the fleur de lys is a prevalent motif. I'm also thrilled to announce I recently was accepted as a new artist member of the Los Angeles Art Association (LAAA) / Gallery 825, a fabulous LA art organization that helps emerging artists establish their careers. Here's a link to my page on the LAAA website. In other important news - I'm now the managing editor of Fabrik Magazine, a quarterly LA-based print art publication, distributed in galleries and museums around Los Angeles - and available by subscription. The next issue will be launched at Fabrik Expo and Photo Independent, two LA art fairs produced by Fabrik Media - April 21 to 23 at The Reef. Fabrik is an LA-centric magazine focusing on contemporary art and design with a sophisticated international flair. I'm delighted to be playing a role in shaping this wonderful - and dare I say - cutting edge publication. I'm also still writing for Art Ltd. Magazine and other publications, and trying to juggle all of the deadlines so I can still make painting a priority. On a more somber note, I'm also struggling to do what I can to resist - and maintain my equanimity - in the face of the new harsh political reality we're confronting in this country today. Last week, I participated with a group of writers from Tertulia Literary Salon as one of the featured readers in Lit Crawl LA / NoHo Arts District. The event is a sort of literary smorgasbord, with several concurrent programs at different venues throughout the evening. Lit Crawl is free and open to the public. It's a great opportunity for emerging writers to get some exposure and instant audience response. It was exciting - and unnerving - to be on the program. I read an excerpt from my wip - which has been in progress for never mind how many years (six). It's been frustrating and sobering to grapple with the challenge of completing a large creative project while pursuing so many other things at the same time. To wit, in the last few months, I've reviewed a number of art exhibits for various art magazines. As of July, I'm now a contributing writer for Art Ltd. Magazine. I'm also delighted to announce that I was just invited to become a contributor for Fabrik. Contemporary Art and Design, another beautiful Los Angeles art magazine. * Alexandra Grant and Steve Roden: These Carnations Defy Language @ Pasadena Museum of California Art published in WhiteHot Magazine of Contemporary Art - my review of the beautiful collaborative exhibit by these two LA artists, inspired by the writing of 20th century French poet, Francis Ponge. * Ed Moses: A Los Angeles Icon in ArtPulse Magazine Issue 23 - an in-depth piece I wrote about Moses, reviewing his recent exhibits at LACMA and William Turner Gallery, touching on my visit to his studio and his retrospective at UC Irvine last year, his life, and the evolution of his oeuvre. 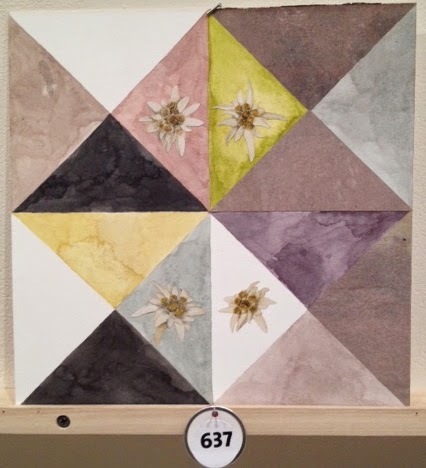 * In Art Ltd. Sept/Oct - my profile of Sara Bright, an LA artist who for the last year has been creating a series of moveable frescoes, recently shown at George Lawson Gallery, San Francisco. Also in ArtPulse Issue 23: My reviews of: Craig Taylor: En face at CB1 Gallery, Christine Frerichs: Serenade at Klowden Mann and Charles Gaines: Gridwork 1974-1989 at the Hammer Museum. Most of these articles are accessible here. When I can squeeze in other projects, I hope to soon resume work on a new series of paintings that have been dancing in my mind for months. Art is a lie that makes us realize the truth. From childhood, when I first became passionate about art and literature, I recognized this instinctively as almost a self-evident - although maybe oxymoronic - truth. Art, a product of the imagination, reveals so much about life and our perception of reality. In my constant rounds of the LA art scene, this revelation is continually reinforced. I'm fascinated to learn about the inspiration behind art, the narrative that propels it, and the light it sheds on the world we inhabit. With every art review I write, I gain a new insight. I'm intrigued by the ripple effect of this knowledge. The learning process is cumulative and filled with coincidence. Once I uncover a clue to the symbolism behind one artist's work, it gives me a bit more code to understand the next work I see. Sometimes that serendipitous connection is subtle, sometimes almost literal. For example, I'm in the process of writing a review of Julie Heffernan: Pre-Occupations - currently at Mark Moore Gallery (link to be posted on publication). In her dramatic canvases, Heffernan portrays herself as a sort of environmental vigilante, entwined with the trees in a struggle to rescue elements of our natural world. Her work, while very different in style, shares common themes with Irene Hardwicke Olivieri, whose 2013 show at Robert Berman Gallery I reviewed in WhiteHot Magazine of Contemporary Art. Both contemporary female artists concern themselves with climate change, featuring their own self-portraits as the dominant figure in their narratives. 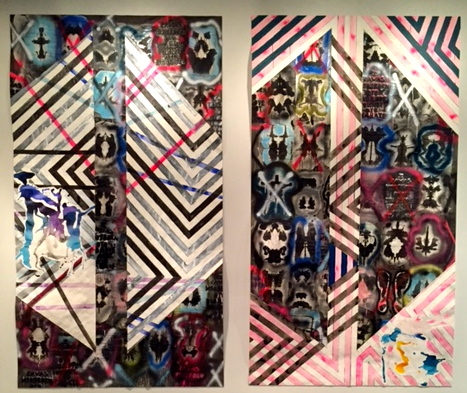 Addressing the same concern from a more abstract angle, are the gorgeous multi-media collages of Merion Estes, whose show, Dystopia, at CB1 Gallery, I also reviewed in WhiteHot Magazine - just published a few days ago. Carol Es: Exodus at Shulamit Gallery - a review of paintings inspired by the artist's meditative and spiritual retreat to Joshua Tree. Hung Liu: Dandelions at Walter Maciel Gallery - a review of the extraordinary recent paintings and mixed media work by the California artist, who came of age in China during the Cultural Revolution. Laura Krifka: Reap the Whirlwind at CB1 Gallery. A longer article on Ed Moses, the iconic Los Angeles painter who has been reinventing his oeuvre his whole career. ArtPulse Magazine is a quarterly print publication. Reviews don't appear in the online edition. I'm also very excited to announce I will be contributing to Art Ltd. Magazine as of the July/August 2015 issue! During Christmas and New Year's, I went to Turks & Caicos and the Bahamas for a family holiday, to visit a friend from my schoolgirl days at the College of the Bahamas, and to do research on the story I'm writing. I lived in the Bahamas when I was growing up and I've spent a lot of time there in recent years. When in Nassau, I always visit the National Art Gallery of the Bahamas, a small museum in the Villa Doyle, a beautifully restored example of British Colonial architecture. Wandering though the galleries, I was thrilled to see The Queen Staircase, (sic) (1986, house paint on board, 36 x 30 inches) by Amos Ferguson, a Bahamian painter whose work my mother collected. 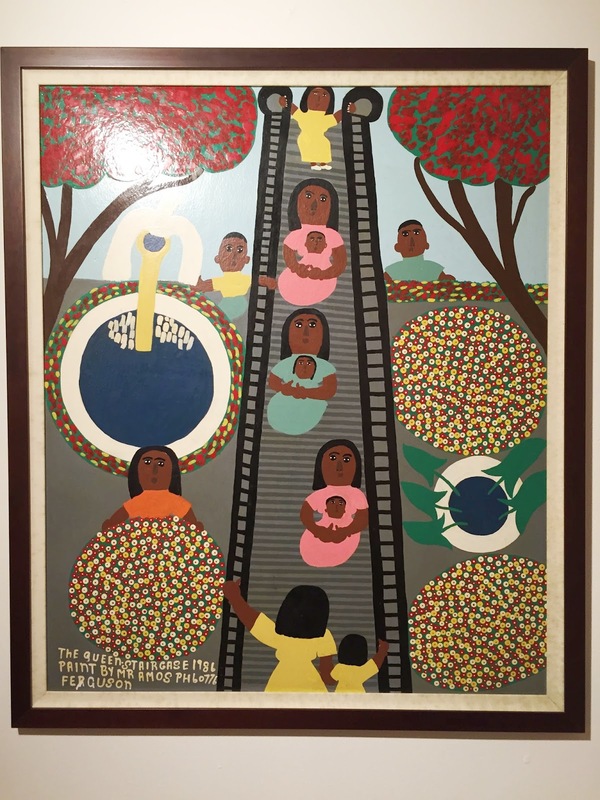 In this image, Ferguson portrayed figures going up and down the Queen's Staircase, an historic Nassau landmark. In the middle ground, three of the figures clasp babies in their arms. They dominate the composition, more prominent than the figures in the foreground and background because of their position, as well as their emotional resonance. Ferguson usually painted in a flat two-dimensional style. His medium was typically house paint, often on cardboard. There was a logic, a sense of balance and symmetry to his work, as in this painting - in which the figures on the staircase, are dressed in yellow, pink, blue, pink and yellow - from top to bottom. In the museum bookstore, I was delighted to find the book, Bahamian Art, which I bought as a reference. It profiles a number of Bahamian artists, including Brent Malone, one of my art teachers at Queen's College, the local high school I attended. Stas Orlovski: Chimera @ Pasadena Museum of California Art in WhiteHot Magazine of Contemporary Art - a magical dreamlike animated vision which married old world sensibilities with new age technology. Lisa Anne Auerbach: Spells @ Gavlak Gallery in WhiteHot Magazine of Contemporary Art - a witty and innovative compilation of knitting and word art. Robert Swain: The Form of Color @ Santa Monica Museum of Art - a stunning immersive scientific survey of the gradation of color. June Wayne: Paintings, Prints and Tapestries @ Pasadena Museum of California Art - a retrospective of this important female artist who spoke out about feminism through her art. Joe Lloyd: New Paintings @ Western Project - dynamic abstract paintings which use geometry and prism shapes as a point of departure. Fabelo's Anatomy @ Museum of Latin American Art - my first feature length review for this magazine - on the mesmerizing paintings and anatomical drawings of Roberto Fabelo, a contemporary Cuban surrealist. Miaz Brothers and The Masters @ Fabien Castanier Gallery - haunting unportraits which convey only a hint of face and figure, leaving identity - the conventional point of portraiture - shrouded in mystery. Indulge me. Let's pretend this blog has been on a planned hiatus, a summer sabbatical. Humor me. I'd like to elaborate. In the last few months, I've seen, and written about, some extraordinary and revelatory art. The last day of September, I was thrilled to visit the Venice studio of painter Ed Moses, whose exhibit with Larry Poons at William Turner Gallery last summer, The Language of Paint, I reviewed in WhiteHot Magazine of Contemporary Art. While Moses and I talked, he selected some of the paintings to be featured in his new retrospective, Cross-Section, at UC Irvine Claire Trevor School of the Arts (October 11 to December 13, 2014). 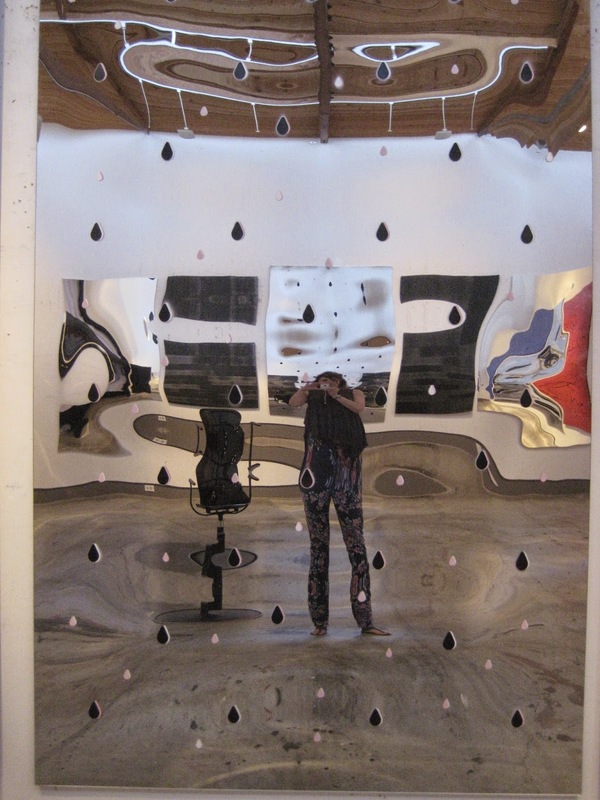 The selfie above is from a magical installation of mirrors and paintings Moses created in his studio, inspired by the Jorge Luis Borges novel, Labyrinths. Last Saturday, I joined Moses and his entourage of artists and friends on a bus ride to Irvine - arranged by Moses and William Turner - for the opening of the exhibit. There, we followed the artist through three galleries of his extraordinary paintings, a sampling from his breathtaking and expansive oeuvre, while he gave us a guided tour, pointing out particular details in the most casual manner, with his cane. I'm hoping to write about this experience for a publication - to be determined. I've reviewed a number of exhibits in the last few issues of ArtPulse Magazine. These reviews are only published in the print edition - not accessible online. Here's a pdf of my review of visionary photography extrapolated from raw NASA and JPL data from outer space - Karin Apollonia Müller - Far Out: Diane Rosenstein Fine Art in ArtPulse Magazine Issue No. 18. In Issue 18, I also reviewed Calder and Abstraction: from Avant-Garde to Iconic at Los Angeles County Museum of Art and Robert Minervini: Until Tomorrow Comes at Marine Contemporary. For Issue No. 19, I reviewed Micol Hebron: (En)gendered (In)Equity: The Gallery Tally Project at For Your Art and Mike Kelley at The Geffen Contemporary, Museum of Contemporary Art, Los Angeles. ArtPulse Magazine is a gorgeous quarterly print magazine covering a broad range of contemporary art. It's available at some fine booksellers, better newsstands or by subscription. If you're in the LA area, I encourage you to make the very worthwhile trip to Irvine to see the spectacular Ed Moses exhibit! This is the tenth anniversary of Incognito, the annual fundraiser of the Santa Monica Museum of Art - probably one of the most fun art events I've ever attended. Some 550 artists donated 700 works of art - all 10 X 10 inches in format. The artists are a mix of the established big names sought-after-by-collectors like John Baldessari - to mid-career artists such as my former painting teacher Quinton Bemiller, as well as emerging artists. The price for all the pieces is $350. The hitch - the artist's name is not revealed until you pay! The line began forming outside the museum at Bergamot Station early in the day. I was lucky to have a media sneak preview at 6 p.m. An hour later, the doors opened. The art stampede began. It's thrilling to see people scrambling for art! At the end of the evening, I was allowed to select from the remaining artworks. I bought a lovely piece - no. 637 (see above). When I picked it up, I found out the artist's name. I was riveted by Jackson Pollock's Mural at The Getty Museum. The painting is stunning - as is the story of its genesis. Commissioned by Peggy Guggenheim in 1943, Pollock painted it before he was well known. In it are tantalizing clues foreshadowing the technique he later developed. The painting had an itinerant existence for decades, then a conservation job in the 70s that saved it from deteriorating, but obscured its true colors behind a milky veil. In the last year, it was restored to its brilliance by the J. Paul Getty Museum and Getty Conservation Institute (GCI). On view until June 1, the Mural is incredible to see. It was like peaking inside a priceless art time capsule. Glorious art treasures, among them two Picasso paintings, a Monet, three de Koonings, a Warhol and much more - which have been tucked away in private collections - some for decades. My favorite was a beautiful Milton Avery, March and Sally Outdoors. As soon as you accept yourself, you can start to have transcendence. What's menacing is not to exercise your freedom. Here's a link to my review of the riveting F. Scott Hess Retrospective @ LA Municipal Art Gallery Barnsdall Art Park - published in WhiteHot Magazine of Contemporary Art.